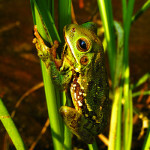 We are happy to announce the FROGS ARE GREEN photo contest. 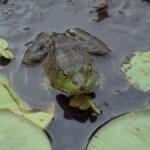 The winner will receive a free “Prince of Amphibians” t-shirt and we’ll feature the photo in the gallery on our blog. See the information on the left side of the blog. 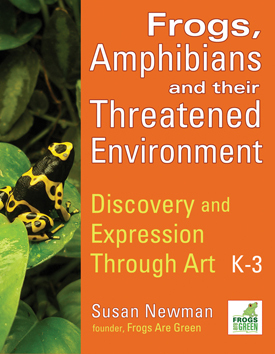 (Note: your photo can be of any amphibian, including salamanders). Try to learn about the animal first. What is its habitat? When are they active? Walk slowly and stop frequently (it helps to have someone with you who is less than 3 feet tall and has sharp eyes). 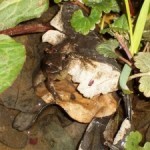 Frogs and toads blend in so well that they are hard to find. Be alert for subtle movements. In summer, you might find the sit-and-wait frog predators hanging out on the edges of ponds and lakes. Be aware of the position of the sun. Avoid taking pictures at midday on bright sunny days. In the morning, face east and it will keep sunlight from coming into your lens and washing out your photos. Don’t necessarily put the subject in the middle of the photo. Keep the whole animal in the photo, but compose the picture so the background tells a story. Bracket your photos, i.e., take the same shot with different settings. Also, try taking a flash photo. Without a flash, animals in photos may look lifeless and poorly lighted. Try to be on the same level as your subject. This entry was posted in Frogs Are Green contests and tagged amphibian photography contest, frog photographs, Frogs Are Green photo contest, Frogs: A Chorus of Colors, photo contest, photo contest amphibians, photo contest frogs, photographing frogs, wildlife photography contest. Bookmark the permalink.